New York may not be the US capital, but there’s a reason they say “So good, they named it twice”. And if you’re heading to the ‘Big Apple’ over the festive season, you’re in for a treat. You’ll find free Christmas Tree lighting ceremonies from December 1 to 8, often with music and snacks thrown in. Try: Astoria Park, December 1; Park Avenue and Queens Botanical Garden, both December 2; Bryan Park, December 4; Washington Square Park, December 5; Madison Square Park, December 6 and West Harlem Piers Park, December 8. In fact, there’s so much to do in this amazing city over the festive season, it’s hard to know where to begin. No visit to New York would be complete without taking in a show on Broadway, perhaps the world’s most famous theatre district. There are still tickets available for the multi-Tony-winning Hamilton, but make sure you’ve got your credit card handy as they don’t come cheap. Or bag some serious bragging rights by heading to the Walter Kerr Theatre, where The Boss, Bruce Springsteen himself, is in residence until December 15. For holiday specials, Radio City’s Christmas Spectacular, featuring The Rockettes, is a not-to-be-missed extravaganza plus there are several versions of Tchaikovsky’s The Nutcracker, from classical to burlesque and hip-hop, playing at venues across the city. 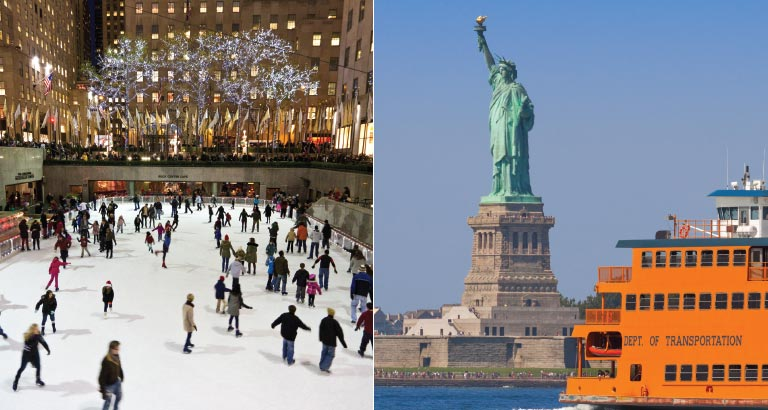 Head to the Rockefeller Center to see the world-famous Christmas Tree and lace up your boots at the ice-skating rink. Don’t worry if you’re not particularly skilled, nor are most other people. While you’re there, check out one of the city’s hidden gems, 620 Loft and Gallery. It’s a series of gardens designed by English landscaper Ralph Hancock. They’ve been closed since 1938 but can be seen from the Top of the Rock observation deck. While we’re on the subject of hidden spots, one of the most romantic is the Whispering Gallery at Grand Central Station where the architecture allows voices to travel from one side of the space to the other. It’s found in front of the famous Oyster Bar & Restaurant, so you can kill two NYC birds with one stone. For shopping, or just looking, take a stroll down the iconic Fifth Avenue where, these days, you really can have breakfast at Tiffany’s. Make sure you also take in the renowned Saks Fifth Avenue window displays, which draw visitors from across the world. And there are holiday markets throughout the city boasting everything from handmade crafts to antiques and, of course, a certain amount of festive junk! Don’t forget a ride on the Staten Island Ferry to see Lady Liberty and end your New York jaunt with another Big Apple must-do, New Year’s Eve in Times Square, a location and occasion that need no explanation.